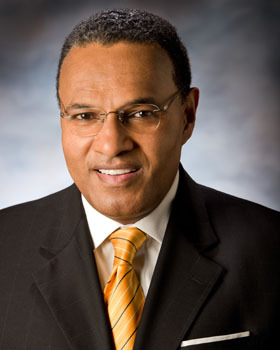 Freeman Hrabowski III is the keynote speaker for the 30th Martin Luther King, Jr. convocation, February 6. Back in 1963, Freeman Hrabowski, keynote speaker for the 30th annual Martin Luther King Jr., Memorial Convocation, was a bookish, chubby 12-year-old who disliked confrontation. But the life of this hard-working, quiet African American kid from Birmingham, Ala. – one of the most violent cities in the South at that time – was just about to change, and all because he’d just seen a speech by a brilliant young minister named Martin Luther King, Jr. The memorial convocation takes place at 7 p.m., Thursday, February 6, at the Santa Cruz Civil Auditorium in downtown Santa Cruz. The event is free and open to the public. Hrabowski will give a talk entitled "The Role of Youth in the Civil Rights Movement: Reflections on Birmingham." “I was not a fighter,” recalled Hrabowski, 63, a former child leader in the Civil Rights movement and now the president of the University of Maryland, Baltimore County, during a candid phone conversation this week while he was trapped for a while at a snowbound airport in Richmond, Va. “The only thing I had ever attacked, in all my life, was a math problem. I was just a little math nerd." But King had arrived that year in Birmingham to fight injustice and rally against segregation, and his words to the congregation opened worlds of possibility for Hrabowski. “I was watching him, and asking people, ‘who is this guy?’” Hrabowski said. “They told me who he was, and for the first time I imagined the world of tomorrow might be different from the world of today." Hrabowski had no way of knowing the seeds of his distinguished career in education were being planted that day in church, when King’s words gave him a confidence he’d never known. That week in church, Hrabowski vowed to join a group of child marchers who would stand with King in his fight against segregation, but his parents, at first, were dead set against it. “In concept they thought it was amazing that children would have the opportunity (to stand up for their beliefs) but then the question became, ‘what about our son, our only child? Are we willing to let him go?’ It took a night of reflection and prayer before they allowed me to go. What they said was, ‘we put you in God’s hands.'" Organizers trained the young marchers to walk peacefully, and not to respond to provocations. The police went after them anyhow. Hrabowski had a nightmarish encounter with Birmingham police chief Bull Connor, whose very name has become a symbol of Jim Crow repression. Hrabowski recalls Connor stopping to speak with him while the police were rounding up the young marchers. King's own arrest in Birmingham became one of the most famous incidents in the Civil Rights era; his legendary "Letter from the Birmingham Jail,'' highlighting the police's brutal treatment of the protesters, including children and the elderly, became one of the most powerful acts of bearing witness during the Jim Crow era. But the hardened young toughs, incarcerated along with Hrabowski, not seem to understand or sympathize with the mission of the idealistic child marchers. This attitude was not unusual; Hrabowski said the marchers also received some blowback from other Birmingham residents who somehow equated standing up for equal rights with stirring up trouble. In September of 1963, three weeks after Rev. King’s legendary “I Have A Dream” speech, Ku Klux Klan members bombed a Birmingham church and killed four girls – three of them 14, one of them 11. The attack was wrenching for the community – but the pain became even worse when a few misguided community members tried to pin the blame on civil rights marchers for standing up against injustice and therefore "provoking" the racists, Hrabowski said. Memories of the bombing remained so painful for Hrabowski that he refused to even talk about it for 30 years, and he refused to even mention his own role in the Children’s Crusade. But he broke his silence for the legendary director Spike Lee, who included Hrabowski in his 1997 documentary about the bombing. Hrabowski overcame his reticence and came to see how much those days guided his current path. These days he works hard to create a climate “where kids can be smart against the disciplines.” He is proud of UMBC for its achievements in the arts and sciences. After arriving there in 1987 as vice provost, he worked hard to fight the misconception that students must come from privileged backgrounds to do brilliant work in any field.